Rooms & Rates: Rates shown are low season to high season. Low Season rates are available from November through April. Our property is adult oriented and pet free for the safety and comfort of our guests. Reservations: Our bed and breakfast is open all year round which includes the Okanagan's Spring Wine Festival in May and the Okanagan's Fall Wine Festival in October. The Lakeview is a spacious, luxurious suite complete with a sitting area, full ensuite, and a balcony overlooking the gardens and beach. 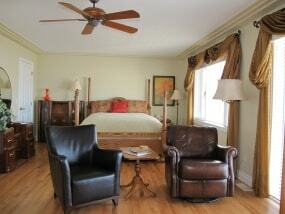 $125 - $185 per night. 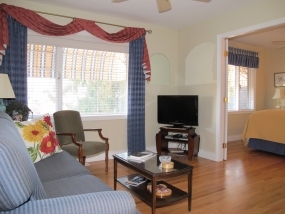 Amenities include cable TV with DVD player, wireless internet and ceiling fan. Reservations: We are open all year round which includes the Okanagan's Spring Wine Festival in May and the Okanagan's Fall Wine Festival in October. Reservations are recommended and a credit card # is required to secure your stay. The Lakeview Bathroom has a full size bathtub and separate shower. 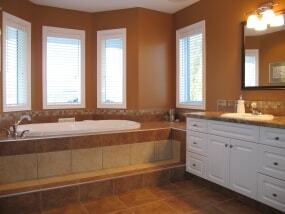 Heated tile flooring provides comfort to complete the luxury. We strongly advise trip cancellation/interruption insurance. See your travel agent/insurance broker. Cancellation within 7 days of your expected arrival date will be charged one nights rate per room reserved. All cancellations are subject to a $25.00 administration fee per room. The Spruceview is a comfortable, nicely appointed suite which includes a sitting room and full ensuite bath with heated tile flooring for your comfort. 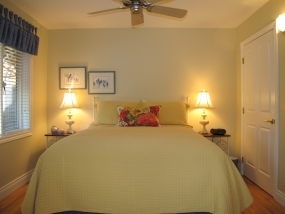 Amenities include cable TV with DVD player, wireless internet and ceiling fans.